As of Wednesday morning, my building has been lacking that most modern of conveniences, hot running water, due to the change over in our hot water heaters. Now I am not one to take for granted hot running water. I love a good hot shower and you'd be hard pressed to find someone who enjoys a warm bath more than I do. 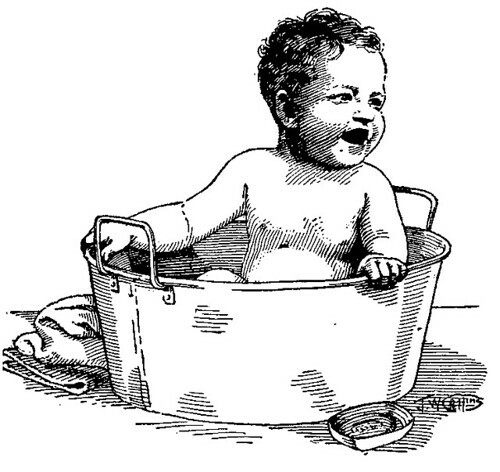 When the days comes when Mr. Cleaver and I will buy a home you can bet your sweet bippy I'll be jumping into the tubs (dry of course) to test them for comfortabilty. Shower only? Forget it. But for these past few morning I have been living a much less modern life, one with hot water pumping through the taps. So to find out how to deal with this development I decided to check in with a more antique source - enter Misters B. G. Jefferis and J. L. Nichols. 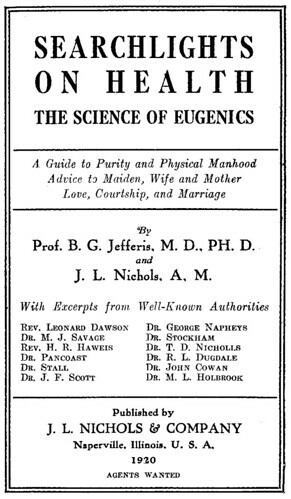 Published in 1920 just a hop, skip and jump of my current home of Chicago, Searchlights on Health is an innvaluable source. In addition to being a guide to "Purity and Physical Manhood" with "Advice to Maiden, Wife and Mother" on "Love, Courtship, and Marriage ," it contained at least three section on bathing. Jackpot! My first though on learning we had no hot water was, maybe I'll just skip the shower today. But Misters Jefferis and Nichols had something to say about that. Every lady owes it to herself to be fascinating; every gentleman is bound, for his own sake, to be presentable, but beyond this there is the obligation to society, to one's friends, and to those with whom we may be brought in contact. 7. Bathing in cold rooms and in cold water is positively injurious, unless the person possesses a very strong and vigorous constitution, and then there is great danger of laying the foundation of some serious disease. 12. 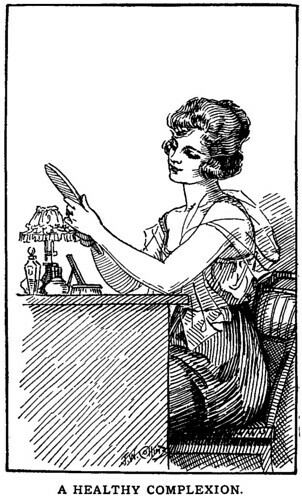 A person not robust should be very careful in bathing; great care should be exercised to avoid any chilling effects. I don't know how vigorous my constitution is, so bathing could put me in some dangerous territory. From the sounds of these guys a cold bath could mean my death! But this long tome is not lacking in answers. For with the help of a kettle I could find myself clean through simple means. 1. Have a large basin of water of the temperature of 85 or 95 degrees. Rub the body over with a soft, dry towel until it becomes warm. 2. Now sponge the body with water and a little soap, at the same time keeping the body well covered, except such portions as are necessarily exposed. Then dry the skin carefully with a soft, warm towel. Rub the skin well for two or three minutes, until every part becomes red and perfectly dry.